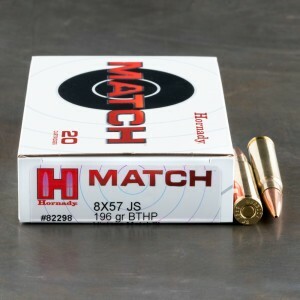 Match grade 8mm Mauser ammunition (aka 8 x 57mm JS ammo) is the ideal choice for target shooters willing to spend a little more to get the very best in ballistic performance. This is, by far, the best ammo in my Yugo Mauser. Very accurate and powerful; it makes a great hog round and deer round. The bullets actually weigh 200 to 202 grain and I've chrono'd the ammo at just shy of 2500 ft./sec.